The Fall Harvest Festival is a wonderful community and campus tradition, and a great way to enjoy the 30-acre organic farm. 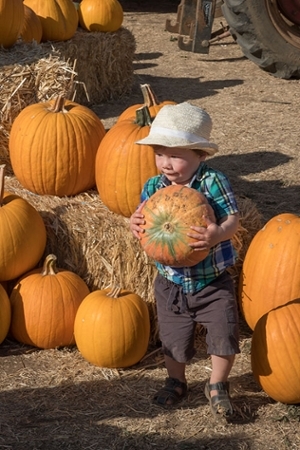 Get your organic pumpkins at the UCSC Farm's Fall Harvest Festival on September 30. Photo by Steve Kurtz. 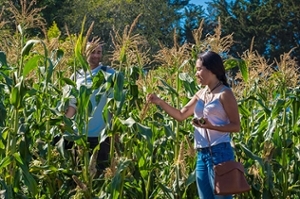 Explore the 30-acre UCSC Farm during the Fall Harvest Festival. Photo by Steve Kurtz. Enter your favorite apple pie recipe in the 17th annual Apple Pie Contest. Celebrate the abundance of the fall harvest at UC Santa Cruz’s 30-acre organic farm, one of the Monterey Bay region’s most beautiful and abundant locations. Fresh produce, live music, farm tours, cooking demonstrations, and much more await visitors at the UCSC Farm & Garden’s Fall Harvest Festival, coming up on Sunday, September 30, from 11 a.m. to 5 p.m. The festival features live musical performances by The Naked Bootleggers and Whiskey West, along with an open mic session. Also on tap: hay rides, kids’ crafts, workshops, food sales, organic pumpkin, produce, and flower sales, flower crown making, and campus and community group information tables. Visitors of all ages are invited to sample apples, try their hand at pressing cider, make a flower crown wreath, enter the pie baking contest, and enjoy locally sourced, tasty treats. The festival will also feature a produce sale with organically raised pumpkins along with dry-farmed tomatoes and other fresh fruits and vegetables. Other activities include workshops on making sourdough bread, promoting garden pollinators, canning tomatoes, and learning about famine foods, along with guided tours of the farm, and a medicinal herb talk and walk through the garden. For more fall fun, there will also be an open mic opportunity. If you'd like to share a live performance, please fill out the google form. Want so see how your favorite apple pie recipe measures up? Be sure to enter the Apple Pie Contest by 12:30 p.m. (see rules, below). The first ten entrants receive a gift certificate for free apples, and there are some great prizes! Admission is free for UCSC students with current ID, kids 12 and under, and members of the Friends of the UCSC Farm & Garden; general admission is $5. The Harvest Festival is cosponsored by the UCSC Center for Agroecology and Sustainable Food Systems (CASFS), the UCSC Food Systems Working Group (FSWG), UCSC’s Measure 43, and the Friends of the UCSC Farm & Garden. For directions to the UCSC Farm, visit the CASFS web site. Free parking will be available at the Campus Facilities and Barn Theater parking lots, and a free shuttle will be available. For more information call (831) 459-3240 or email casfs@ucsc.edu. Pie entries accepted 11 a.m.–12:30 p.m. The Friends of Farm and Garden Apple Pie Bake-Off is a nonprofessional baking competition open to Harvest Festival attendees (entry to the Harvest Festival is $5; free admission for UCSC students, Friends of the Farm & Garden members and for children 12 and under). Contestants’ entries are judged on taste, presentation, and creativity. 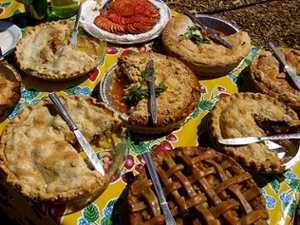 All pies must be entered by 12:30 p.m. on Sunday, September 30, at the Fall Harvest Festival, UCSC Farm. For questions or additional copies of the rules, call (831) 459-3240 or e-mail casfs@ucsc.edu.